Convenient and targeted for all your shrub, tree and leafy weeds. No spray – cut’n’paste your stumps and clumps away! 120g/L of glyphosate gel. Make a horizontal cut through your tree or shrub very close to the base. Immediately apply a thick layer of gel as in the photo. The gel will soon be drawn into the plant’s root system and seals the cut. Most plants will show no regrowth. Any regrowth should simple be retreated. For gorse and other more highly coppicing plants such as Chinese privet, use Bamboo Buster. For herbaceous weeds use wipe onto the underside of a few of the leaves, that’s it (plants will start to die off after a few days). The gel won’t travel through soil to affect untreated plants. It’s sensible to use disposable gloves when applying. Avoid using on rainy days to reduce the risk of runoff. Clean the brush top after use to remove gel and plant debris and replace the cap. The empty container can be recycled. 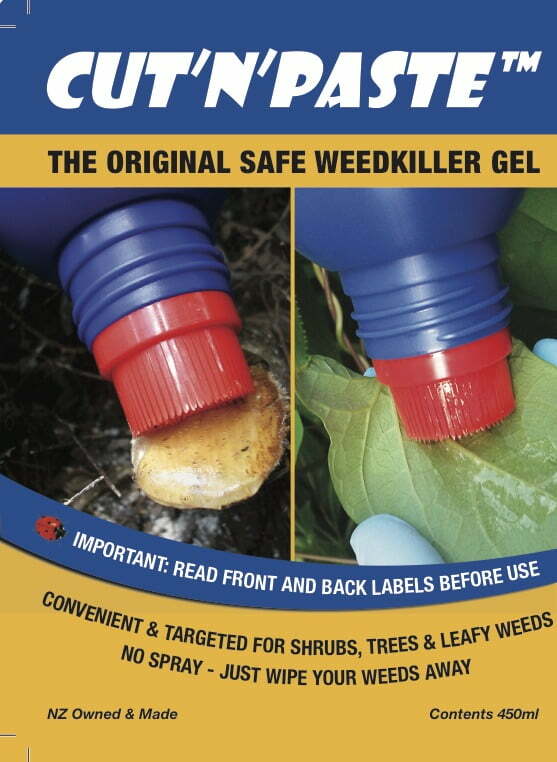 Cut’n’Paste is ideal for weeds in reveg plantings, riparian areas, close to sensitive plants etc. No need to spray and risk your health or your other plants. Do not apply on or around food intended for humans or animals. In the closed original container in a cool dark place away from children, pets, foodstuffs, seeds, fertilizer and pesticides. Kept as recommended the gel should show no deterioration for two years from the date of manufacture (DOM). Skin and clothes contact – wash thoroughly.